Conversational interaction with smart machines such as home digital assistants is a growing trend, and just one that is driving development of new high tech products that can listen to their surroundings, interpret commands, or gather contextual or environmental data. By Bruce Rose, Principal Applications Engineer, CUI. Accordingly, the market for the latest MEMS (Micro-Electro-Mechanical System) microphones is growing quickly, but they are not the only technology on the block. The traditional Electret Condenser Microphone (ECM) remains a viable candidate for many applications. To assess the strengths of each type, let us first look at their operating principles and construction details. First, consider MEMS microphones. Their typical construction as shown in figure 1 combines the MEMS transducer die with a signal-processing ASIC (Application Specific Integrated Circuit) placed side by side on a printed circuit board (PCB). A protective casing such as a metal can is placed over the top. A small hole is required to allow sound waves to enter the sensor and may be fabricated either in the top cover or the PCB depending on whether the microphone is top-ported or bottom-ported. Figure 1. Typical MEMS microphone construction. The MEMS transducer is fabricated in silicon by a selective-etching process that forms a mechanical diaphragm and support structure. As the diaphragm deflects due to sound pressure, the resulting change in capacitance is converted to an electrical signal in the companion ASIC. The ASIC contains an audio preamplifier whose analogue output can be taken directly off chip. On the other hand, in a digital microphone, the signal from the preamplifier is connected to an Analogue-to-Digital Converter (ADC) and encoder also integrated in the ASIC. Pulse Density Modulation (PDM) is a popular digital encoding format; it not only simplifies transmission, since only a clock and a single data line are required, but also eases decoding at the receiver. 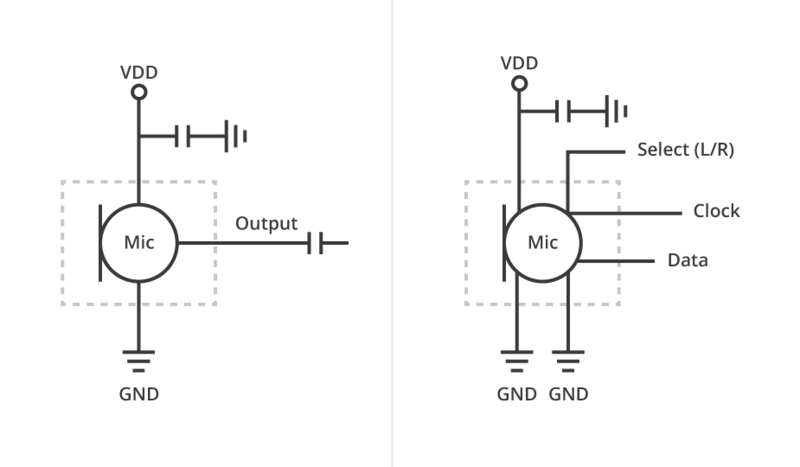 Figure 2 compares application schematics for analogue and digital MEMS microphones. Figure 2. The analogue circuit on the left ensures simplicity, while the digital circuit on the right delivers advantages such as high noise immunity. Figure 3 illustrates the typical construction of the ECM. The electret material has a fixed surface charge and is mounted as a diaphragm between the metal washer and plastic spacer shown. It is positioned close to the conductive pickup plate and hence forms a capacitor in which the air gap acts as the dielectric. Sound-pressure waves make the diaphragm deflect, causing a change in capacitance that produces a varying voltage according to ΔV = Q/ ΔC (where Q = a fixed charge). Figure 3. Generic cross section of an ECM. The transistor shown in figure 3 is a JFET that amplifies and buffers this varying voltage signal. The JFET is usually connected as common source, with an external load resistor and dc blocking capacitor in the external application circuit as shown in figure 4. Figure 4. Typical ECM application circuit. MEMS microphones hold several advantages including small package sizes that make them an attractive option in space-constrained applications. With both analogue and digital signal-conditioning circuitry integrated, designers can save PCB real-estate and bill of materials costs. Another strength is that analogue MEMS microphones have relatively low output impedance, while digital devices are largely unaffected by external electrical noise. This makes them suitable for use in environments containing strong electromagnetic or RF fields or where long wires are needed to connect the microphone. MEMS microphones also offer excellent immunity to interference from mechanical vibrations. 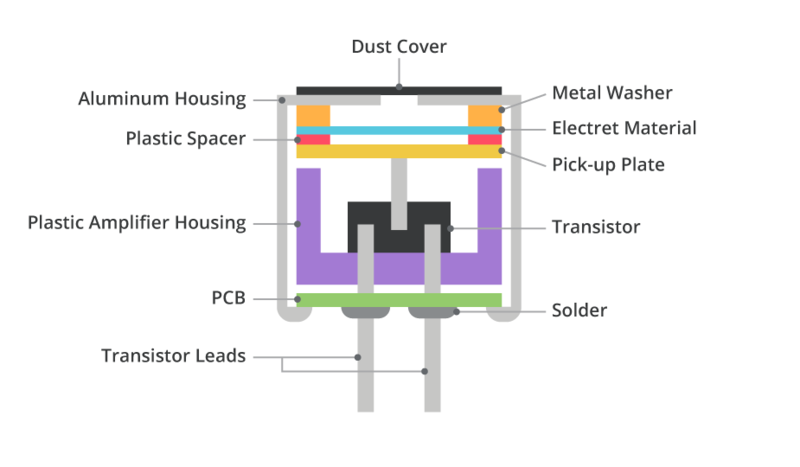 In addition, today’s ASIC fabrication processes ensure close matching of electrical parameters and excellent temperature stability, enabling engineers to rely on outstanding uniformity in any application where an array of microphones is required. 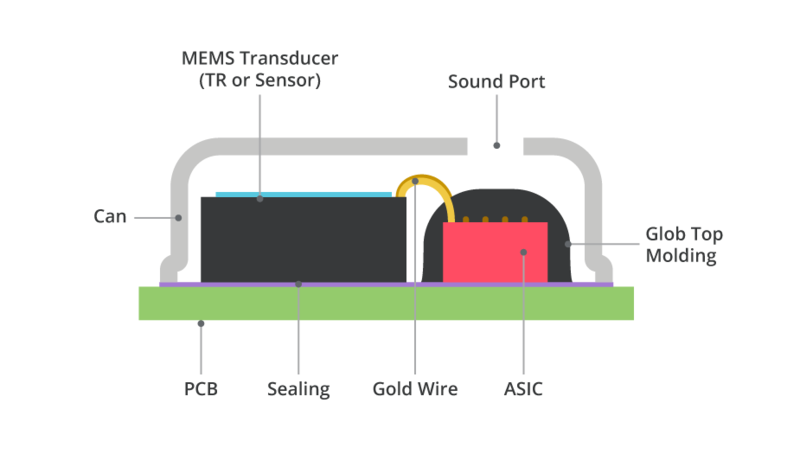 MEMS microphones are also easy to handle during final product assembly since they are compatible with surface-mount placement processes and typical lead-free reflow soldering profiles. On the other hand, ECMs have several features that make them an attractive alternative in certain applications. One of these is the wide variety of electrical termination options, including pins, wires, solder pads or spring contacts, in addition toSMT terminations, which can set designers free from conventional PCB-mounting constraints. In addition, their larger physical size simplifies effective sealing against dust and moisture. As a result, ECM offerings with high Ingress Protection (IP) ratings are readily available. Versatile acoustic properties are another feature, including unidirectional or noise-canceling ECMs that let designers leverage non-uniform spatial sensitivity to ensure high immunity to background audio noise. ECMs also tend to have a wider operating voltage range, ensuring reliable operation in products where the voltage rail may be loosely regulated. In addition, an ECM may be preferred when upgrading an existing product. Many legacy designs use this type of microphone and it can be easier to choose the same technology - often benefiting from improved materials and quality in later-generation equivalents - to streamline redesign work and accelerate time to market. Ultimately, a combination of constraints will determine the optimum choice of microphone for any given application. A broad selection of MEMS microphones and ECMs ensures flexibility for designers. MEMS technology currently dominates statistics for market growth due to its many inherent advantages, but versatile termination options and directionality are two key strengths of ECMs that engineers will continue to value whether updating legacy designs or developing completely new products. CUI is committed to both technologies and maintains an extensive range of microphone products to offer the greatest possible choices for customers.